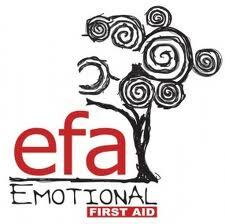 We are an authorised training provider in Emotional First Aid for Young People and for Primary School children. Emotional First Aid is about encouraging the wider Children’s Workforce to get alongside a child or young person experiencing emotional distress, before any professional help is sought. We hope this will build capacity, capability and confidence in these Universal Services. Designed for professionals and volunteers working with children aged 4-11 and young people aged 11-25, Emotional First Aid is about encouraging professionals to use their skills to detect early signs of emotional distress in a child or young person and intervene before it develops further to their detriment. Participants are provided with the tools to look beyond the presenting behaviour of the child or young person to understand the emotional reasoning behind it. We deliver courses from our in-house training room throughout the year and can also deliver the training directly to your workplace on request.